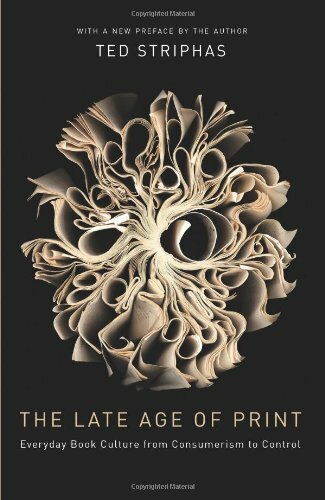 It wasn't until after I read Ted Striphas' book The Late Age of Print: Everyday Book Culture from Consumerism to Control that I realized that its title and subtitle are somewhat at odds with each other. As I began reading, it was the title that governed my expectations: coined by Jay David Bolter, the phrase "late age of print" is meant to be analogous to the Marxist concept of "late capitalism." "Late" in this case suggests a highly developed, sophisticated set of structures that are beginning to fall into decadence—structures that have lost their essential motive energy and are living off capital generated long ago. With these thoughts in mind, I was expecting and hoping that Striphas would provide a kind of critical ethnography, and perhaps a diagnosis, of print culture in the past hundred years or so. But no: the book really isn't about print culture at all; it is rather, as the subtitle more reliably informs us, about book culture. (A book on print culture—indeed, on "the late age of print"—would need to deal with newspapers, magazines, even the advertisements that show up in our mailboxes. Striphas does not mention any of these.) In his introduction Striphas cites the late great Raymond Williams' comment that only quite recently have books have become readily and cheaply available to the average person, employing that shrewd observation as a springboard for his own chief concerns: "The everydayness of books belies a long, complicated, and still unfinished history, one intimately bound up with all of the following: a changed and changing mode of production; new technological products and processes; shifts in law and jurisprudence; the proliferation of culture and the rise of cultural politics; and a host of sociological transformations, among many other factors." As The Late Age of Print unfolds, it becomes clear that Striphas understands these concerns largely as a matter of one activity: the business of selling books. So he explores the possible business models for electronic books; the history of chain bookstores, especially Barnes & Noble (which had its origins in Wheaton, Illinois, of all places); the influence of Oprah's Book Club; and the rise of the Harry Potter series from one obscure novel to a vast empire-unto-itself. Striphas tells these stories pretty vividly, but most of them are well-enough known already—it's not clear whether we need another recitation of how James Frey's memoir A Million Little Pieces was revealed to be fiction—and it's hard to see what they all add up to. As I put the book down I reflected that it might better have been titled Selected Episodes from the History of the Twentieth-Century American Book Business. Book culture is far more than the book business, but rare are the moments in this book when Striphas recognizes that. The handful of pages in which he describes the comments of participants in Oprah's Book Club are among the most interesting in the book, in part because they only touch lightly on the business end of the book world. It's a nice change of pace. The story of Candy Siebert—who at age forty read a book for the first time in her life, Wally Lamb's She's Come Undone, thanks to Oprah's recommendation—is worthy of a good deal more attention than Striphas gives it. It would be a difficult task indeed to trace the relations between the wheels and cogs of the conglomerate-owned American publishing world—She's Come Undone is published by Pocket Books, which is a subsidiary of Simon & Schuster, which is owned by CBS, which is controlled by a vast company you may never have heard of called National Amusements—and one woman's extraordinary experience with a novel—"I cried at the end and it was because I finished it and it was a great book"—but a writer who could do it would make a major contribution to describing what book culture really is. The Late Age of Print is so occupied with the economics of the book trade that it scarcely concerns itself with the lives of readers. Now, that economic history has some fascinating twists and turns. Early in the book Striphas does an excellent job of showing how books were originally marketed as gifts, especially for Christmas and just at the time when Christmas was being transformed into a festival of conspicuous consumption. And he cites to good effect the historical work of Rachel Bowlby, who has shown that "in the history of shop design, it is bookstores, strangely enough, that were the precursors of supermarkets. They, alone of all types of shop, made use of shelves that were not behind counters, with the goods arranged for casual browsing and for what was not yet called self-service." 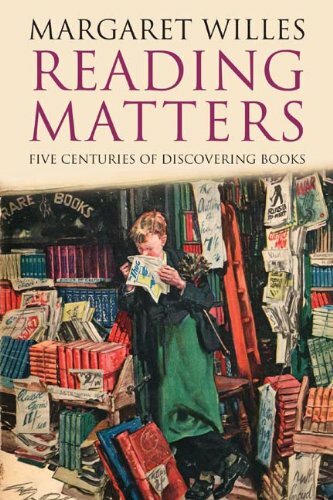 The economic history of bookselling is well worth our attention; but it should not be presented as a meditation on book culture, much less print culture.